These Heavy-Duty Badge Holders are ideal for everyday use as permanent or temporary identification. 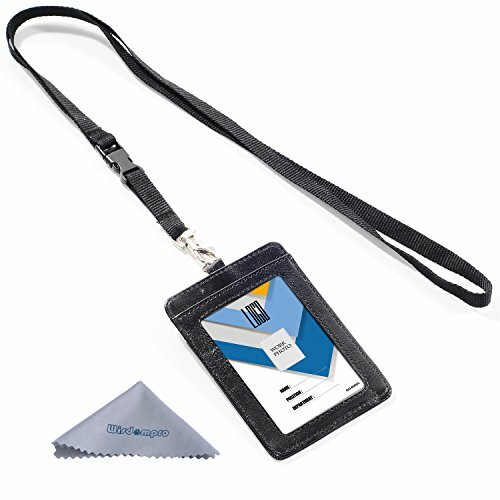 Great for access control cards or name badges. The heavyweight plastic holder is reusable and features our Secure Top design that keeps badges from falling out. Nonelastic, 36" neck cords are included. Holders are for use with Avery Name Badge Inserts #5390 and #5392 (not included). 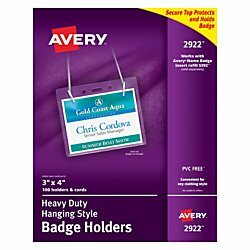 This 2-pack of 200 total hanging style name badges with lanyards is perfect for multi-day events such as meetings, conferences, tradeshows and seminars. They feature an ergonomic and stylish design that complements virtually any clothing style. The micro-perforated blank name badge inserts let you print on both sides so you can add vital information like meeting agendas, maps and more to the backside of the tags. 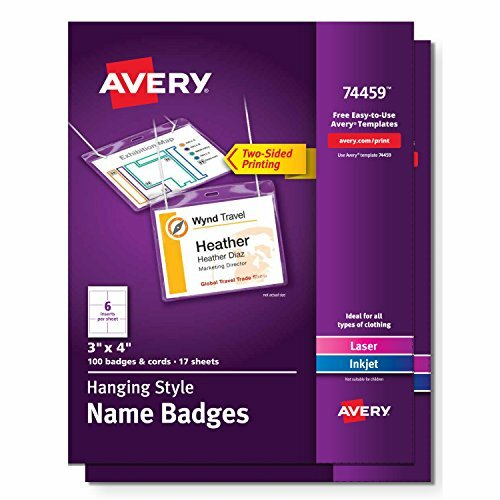 Creating professional lanyard style name tags from your home or workplace has never been easier with Avery's Design & Print Online Software. Personalizing these hanging name badges is a snap: Import contact information and easily add company names, personal titles, logos and more using the free templates and designs at avery.com/templates. Then, print out your name tags using a laser or inkjet printer and insert them into the soft, clear badge holders and attach the straps. 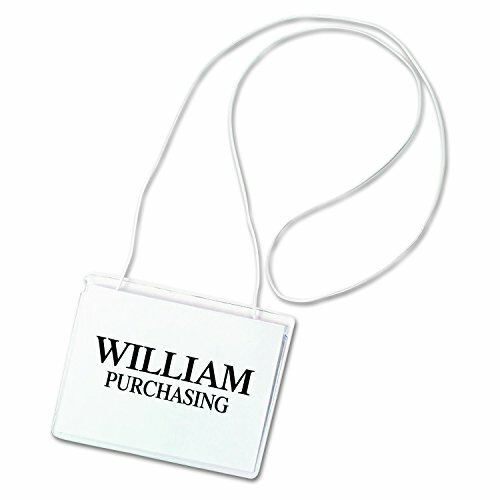 Make a lasting first impression with these lanyard style name badges at your next corporate event. 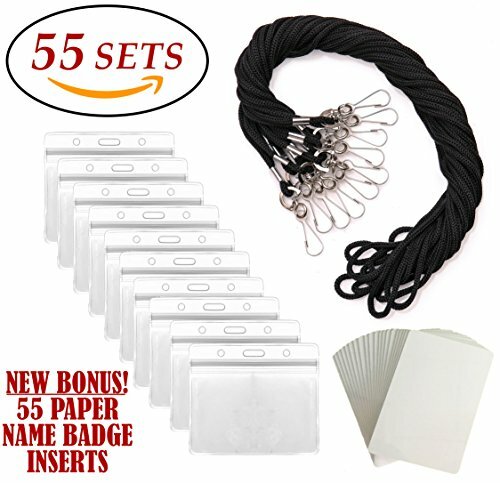 This pack of 50 hanging style name badges with lanyards is perfect for multi-day events such as meetings, conferences, tradeshows and seminars. They feature an ergonomic and stylish design that complements virtually any clothing style. The micro-perforated blank name badge inserts let you print on both sides so you can add vital information like meeting agendas, maps and more to the backside of the tags. 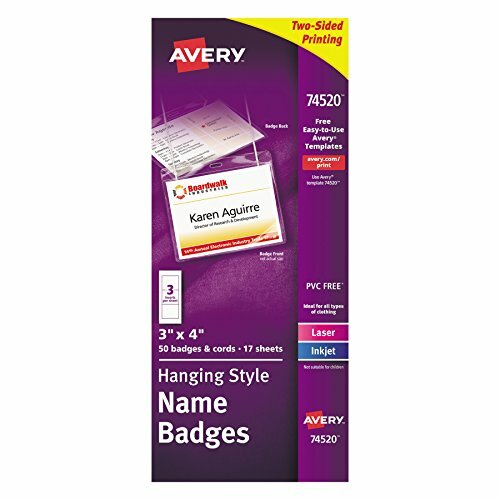 Creating professional lanyard style name tags from your home or workplace has never been easier with Avery's Design & Print Online Software. Personalizing these hanging name badges is a snap: Import contact information and easily add company names, personal titles, logos and more using the free templates and designs at avery.com/templates. Then, print out your name tags using a laser or inkjet printer and insert them into the soft, clear badge holders and attach the straps. Make a lasting first impression with these lanyard style name badges at your next corporate event. 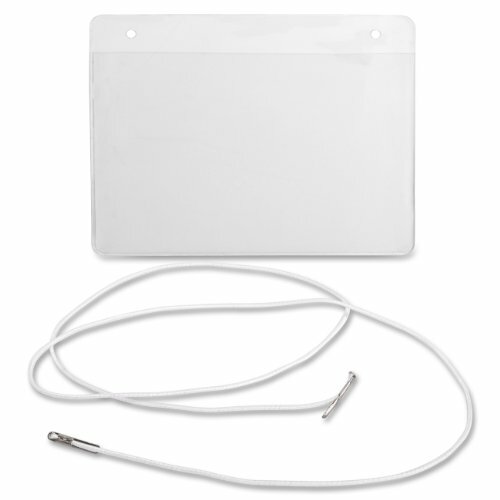 The C-Line Hanging Style Name Badges with Elastic Cords eliminate the need to clip or pin your badge to your clothing. They hang comfortably around your neck and feature a 30 Inches white elastic cord for the utmost convenience in name badges. The holders are sealed on three sides and are easy to load from the top. Each kit contains printer inserts and instructions so you can have professional-looking name badges in no time! 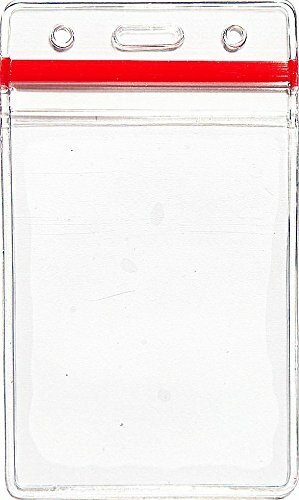 Replacement inserts let you use the holders repeatedly. The badges are 4 x 3 Inches and there are 50 kits per box. Color: 10 pack 3. 5x2. 3" vertical red zipper. This is the most versatile badge and card holder you will ever own! 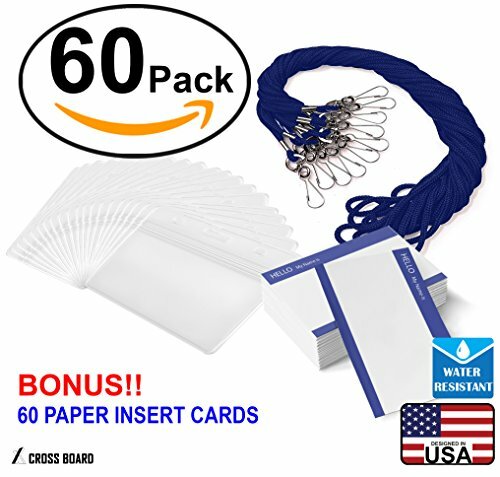 Not only is it detachable 23 inch Polyester strong yet soft lanyard mode - it can also hold any and possibly about 3 to 4 cards at the same time! It's like a slender wallet for your when you are at the office, jobsite, convention, or special event. ID's, event or location passes, name cards or business cards - all of these could fit into this specially designed with 1 ID Window and 1 Card Slot tough PU LEATHER badge holder. Comes with our customer satisfaction warranty! Dimensions: Front ID Pocket Size: 2.54"x3.6" (65x92mm) Back Card Pocket Size: 2.54"x3" (65x76mm) Holder Thickness: 1/6"(4mm) Wisdompro Retail Package includes: 1 x PU Leather ID Holder (Paper ID card excluded) 1 x 23" Polyester Neck Lanyard 1 x Wisdompro 4x4" Microfiber cleaning cloth More badge holder, please go to: http://www.amazon.com/dp/B016VS0086 For more lanyards, please go to https://www.amazon.com/dp/B01DJ3B28S Wisdompro Customer Satisfaction Warranty: If you encounter issues with any Wisdompro product, please do not hesitate to contact us, we will be happy to help you solve it. Wisdompro® is a registered trademark protected by US Trademark Law. Wisdompro® products are sold by authorized sellers only.